Hitachi HiQ eSystems® monitors perishable assets to ensure safe, reliable, sanitary transportation and storage. Challenging the Future through Engineered Solutions hiqesystems.com 844-511-5999 Protect your brand. Protect your assets. 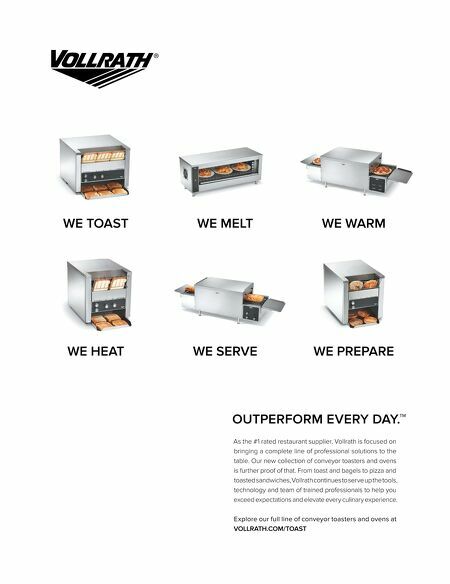 H I G H Q U A L I T Y F O O D S A F E T Y P A R T N E R A higher level of food safety intelligence. Track back of house in real time via desktop, tablet, or smartphone Record temperatures automatically at all times Alert via text, email, or call Protect your assets 24/7, 365 The Cafe The first station customers see when they arrive in the cafe is the salad area. "The salad bar's oval shape allows appropriate, fluid circulation because people aren't bumping into corners," Condenzio says. Nearly 40 rotating selections sit in cold wells for customers to help themselves. The salad bar also features composed salads such as Caesar and panzanella, as well as composed salads made with quinoa and other whole grains. The cafe offers two soups daily, such as New England clam chowder and Caribbean chicken and coconut, plus a chili, such as Rocky Mountain or five bean. An undercounter refrigerator sitting beneath the salad bar holds backup ingredients. All menu items in the HKS cafe are selected from a baseline of nutrition provided by the Harvard T.H. Chan School of Public Health Department of Nutrition's Healthy Eating plate and its parallel Menus of Change initiative with the Culinary Institute of America, focused on both nutri- tional and environmental sustainability. Menu items reflect seasonal availability of ingredients. The dramatic change in the buildings was a main highlight of the Harvard Kennedy School project for architect George de Brigard, AIA, LEED AP, BD+C. He is an associate partner at Robert A.M. Stern Architects LLC in New York. "The previous buildings at HKS were all opaque and fragment- ed. It was hard to see in and appreciate how active the school was from the outside, and on the inside everyone seemed to be hidden behind closed doors," de Brigard says. "In the new spaces, we focused on creating visual connections between spaces — connecting the inside the outside as well as creating clear lines of site between important functions," de Brigard says. "We reinforced this with a consistent palette of stained American oak, from the fins of the brise soleil on the exterior to the wood slat ceiling that carries throughout the entire open plan of the first floor. The result is a whole new sense of community, built from materials of clarity and warmth, that has brought the school together in a new way." de Brigard points out three additional key features of the project: 1. The unified environment. From the start, HKS project team members knew they wanted the project to create a real campus out of their collection of buildings — a campus that was a unified environment that invited engagement and discussion. Creating spaces and facilities that kept students and faculty on campus was a big part of the solution, and we knew that upgrading and expanding the cafe and dining spaces was key. 2. The double-height dining area. The heart of the new building is a double-height dining area, adjacent on one side to the new four-story Wexner Atrium and overlooked on the other by a large lounge. These spaces bring the whole campus together several times a day for meals, but also create a see-and-be-seen location to study, work in small groups, or just hang out. 3. The newloading dock. Before the campus transformation, the materials management at HKS, including food delivery, was in near crisis state. We inserted a loading dock in the midst of the ex- isting buildings, covered by 23,000 square feet of extensive green roof, accessible by pedestrians and cyclists from two sides of the campus. This new loading dock solved many service and security problems for HKS while also untangling the vehicle and pedestrian circulation that had been creating headaches for decades. 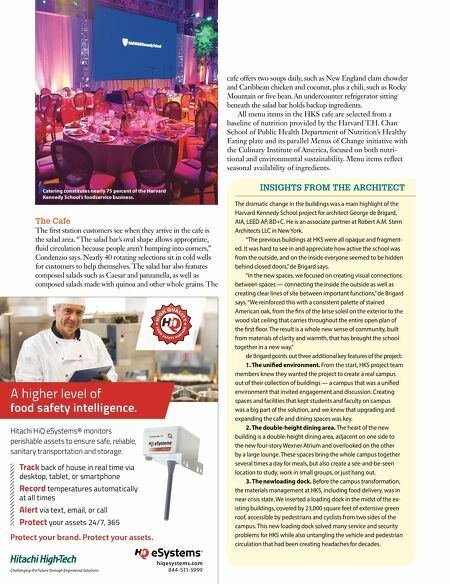 INSIGHTS FROM THE ARCHITECT Catering constitutes nearly 75 percent of the Harvard Kennedy School's foodservice business.